Thyroid medication causing skin hives on body. My question is related to the use of various medications and the appearance of the dermatographism skin problem. More specifically, my question is: can Levothyoxine cause hives/dermographism? Levothyoxine is a medication that I am taking for an existing thyroid problem. 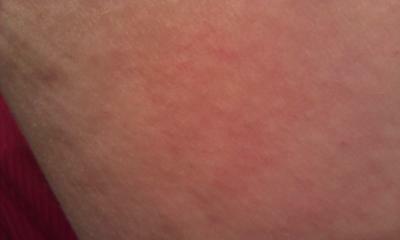 I have never had skin hives before. However, when I started taking my medication for my thyroid problem, I started breaking out with hives. In terms of where the hives appeared, I have a large mass of hives on my side, and patches on the back of my legs, arms, and sometimes my stomach as well. 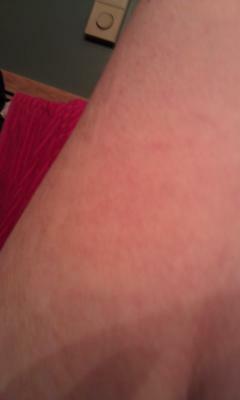 I have attached several pictures of the red hives and dermatographism skin problem so that you can actually see what I am referring to. I have seen an allergist and he thinks the skin hives will just go away on their own. However, my doctor disagrees wholly when I said it could be the medication. Doing some research online I found that the first common side-effect of this medication is hives. SO could it be the result of this? As you are likely aware from reading through the information on this website and reading stories from other dermatographism sufferers there are many different possible causes of dermatographism and therefore, we say that the cause of dermatographism and the skin hives associated with this problem is unknown. Various medications are suspected of causing dermatographism and the fact that hives are a likely side-effect of taking the Levothyoxine, leads one to believe that there is some kind of link. The question is really what happens in the long-term. Is the dermatographism and/or hives only a result of being on the medication and will they disappear once you are no longer taking the medication or has the medication caused a more serious dermatographism problem that will remain with you even after you stop taking the drug. Hopefully, it is not the second scenario. Note that any skin rashes that appear when taking medication should be discussed promptly and thoroughly with a physician to ensure there is no allergic reaction or other underlying problem that is occurring. I had hyperthyroidism - I began to get hives a year ago that became large disc shaped areas (sometimes as large as two feet across). Mine predate medication but have not disappeared since being on methimazole, post thyroidectomy or the advent of taking levothyrozxne, so I am inclined to believe they are related to thyroid imbalances over medication. 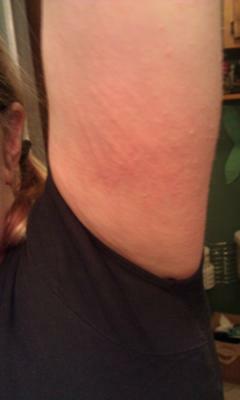 My allergist agrees - she says hives do not last 3-5 days as mine do and don't behave the way mine do.